Ngorongoro Conservation Area - Great Tours and Safaris in Tanzania! The Ngorongoro Conservation area covers 2286 sq km and encompasses the volcanic area around the Ngorongoro crater - including the still active volcano of Oldonyio Lengai, and the famous Olduvai Gorge. 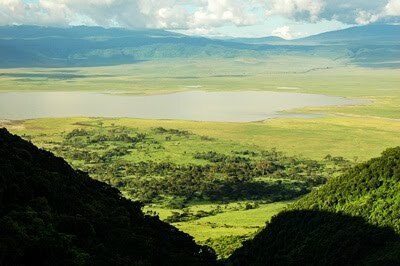 Its centerpiece, the Ngorongoro Crater, is the largest unbroken caldera in the world; it is breathtaking. The floor of the crater is only 100 sq miles, but is home to around 30,000 animals with a high concentration of predators. The steep walls rise 610 m and although this presents no problems for black rhino, buffalo, male elephant and gazelles; giraffe and female elephant are absent. 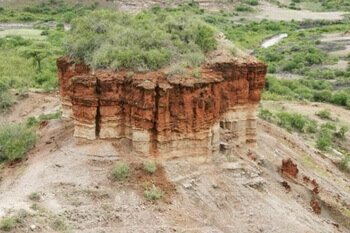 Olduvai Gorge, the “Cradle of Mankind”, is a treasure trove of archaeological sites: filled with fossils, settlement remains, and stone artifacts. One can see the evolution of prehistoric man in the landscape’s geological strata. It is the world famous site of the Leakey’s discovery of a hominoid skull dating back 1.8 million years. There is a small but very informative museum located at the visitor center.